Whether you’re a developer, marketer, entrepreneur or Fortune 500 CEO, there’s an inkling in the back of your mind that perhaps, in the near future, your job or company may be obsolete. It’s not an unfounded fear. The rules to success for nearly all industries in today’s economy are fleeting, at best. Everything keeps changing, and the best of the best have to be able to pivot –– quickly and competently –– in order to keep up. This need positions the biggest brands of the world well, enabling them to form monopolies, of sorts – in theory at least. Yet, that isn’t what we’re seeing take shape. Large organization move too slowly to pivot quick enough to execute well on trends. Instead, those companies end up buying the brands that do (re: Walmart acquiring Jet.com and Unilever buying Dollar Shave Club). What enables those up-and-comers to take on their legacy competitors (i.e. Amazon and Gillette)? Agile marketing that gets these brands to the forefront of customer conversion in a more compelling way than traditional companies. This guide will walk you through what I believe to be the first step toward agile marketing for large enterprises. Startups focus on marketing, because their technology is covered: Enterprise brands can do this, too. I explain how. There are 3 pain points that often forces brands to migrate to new technology – and all of them are signals that you should have done it much, much sooner. But I believe in staring at a problem. We’ll walk through how you can do it right now. Your 3 options when it comes to ecommerce technology. Not every solution is right for every brand. But there are ones that will eliminate the need for you to migrate ever again –– and ones that will force this process time and time again. We’ll go through the cost/benefit analysis of these. The 6 steps to an ecommerce re-platforming and migration. The biggest 2 of which are issuing the RFP and transferring the data. I’ll give you an RFP template you can print out and use right now –– and introduce you to services teams that will migrate your data for you. A primer on what NOT to do during a shopping cart migration. Again, I don’t like to admire problems. I address them. This is the elephant in the room. The #1 rule? Don’t over invest. The point of your technology is to enable better and more effective marketing and sales. Whizzbang is nice, but not necessary. We’ll give you an ecommerce replatforming checklist. If you it this far in the piece, I’m assuming you, like me, like to get things done. This list will let you mark off one by one the steps you and your team need to take to do it first the first time, and then never again. We’ll teach you how to put platforms to the test. Sure, you issue an RFP and sure, you get answers back. But do not buy before you try. Do not buy before your developers try. Do not buy before your legal tries. DO NOT BUY BEFORE YOU TRY. Another word on data migration services – because some platforms offer them for free, some services are self-serve and others are just plain worth the dollars to make sure your data transfers effectively. It is how you upset. It is how you better target marketing. It is how you know how your business is running up and to the right and not vice versa. It matters, so it gets its own section. Finally, I’ll debunk the most common data migration myths out there. Just for fun. What allows these companies to focus on marketing is their choice of technology stack from the onset. Or, if not from the onset, these companies are quick to replatform to a better solution, so that website maintenance and bug patches are not taking priority over marketing activities. The latter leads to sales, growth and revenue. The former doesn’t have to be business as usual. That is why you must pick the right ecommerce platform – because you need to focus on marketing and growth. After all, marketing is expensive, competitive, and requires a lot of time. In the ones where it isn’t – say, SEO – you’re competing against a gamut of competitors and bigger brands, often with a much bigger head start. And, each of these channels are getting more and more saturated everyday. So why are you spending your time and money on a “good enough” ecommerce solution? Modern ecommerce platforms are the equivalent of a marketing technology, development and IT staff – all in one. Likely when you first launched your brand, ecommerce platforms were cumbersome, expensive and required hours of extra work you ended up taking on internally or that you’ve outsourced to platform experts. Today, there are ecommerce platforms out there that take all the technical heavy lifting off your hands –– allowing your team and business the time and financial resources needed to capitalize on the market with strategic and engaging campaigns. You set yourself up for success. Would you still be using a Nokia brick phone today? No. The Capt’n Crunch-size chip used in there is now the size of your fingernail –– and it stores a whole lot more. Upward mobility requires change. Future-proofing is how you blockade against antiquation or even worse, extinction. The line is drawn in the sand. It’s time you choose your side. Do 1 or More of These Issues Apply to You? In a perfect world, a site replatforming project would be a year in planning. You would have allotted budget and defined clear goals. In reality, replatforming isn’t something companies proactively plan. Most often, there’s some driving issue — or a number of them — forcing a company to migrate. Our team sees these issues regularly – and have compiled a string list of the most common below. Go ahead, check off right next to the ones that apply to your business. Check off more than one, and it’s time to replatform. We can’t afford to continue doing business with our existing ecommerce platform due to the high maintenance costs. We experienced a recent merger or acquisition, allowing for consolidation and review of current platforms for efficiency gains. We’re working on new initiatives such as launching new brands, product lines or launching into new markets. With new launches, we want to test out more cost-effective solutions in order to prove out concept. We’ve begun to see that the more cost-effective platforms outperform our legacy platform the main brand is using. Our old solution has grown unstable under peak traffic conditions, resulting in slow site performance and bad customer experience. The catalogue database can’t handle the physical number of SKUs we’ve added to the catalogue over the years. The platform only captures a limited number of attributes, can only associate a limited number of product related assets, has a limited call volume on APIs or, as in some cases, can’t handle certain types of content such as video. It takes too long to develop new features on the old platform and the backlog of projects in IT is becoming unmanageable and cost prohibitive. In our organization, our marketing team is the tip of the spear for online growth. Our marketing team is tasked with not only reaching potential customers and driving traffic to the site, but also converting at the highest rate possible. We want something more intuitive, allowing us to be more creative and quick in our GTM execution. Improved Site Search: Directed and faceted. Marketing wants to be able to control search results for the best possible user experience. Personalization: Dynamic content presentation and optimization based on multiple visitor personas. Mobile Commerce: Specific design and funnel for mobile devices in the wake of mobile-first customer expectations. Social Media: Hooks for marketing on the top social sites, easy share-ability and social commerce capabilities. Tag Management: Re-tagging the site for efficient digital marketing, increased search functionality and better SEO based on Google’s indexing of the site map. Any one of these requirements could be justification enough for a new platform. Most companies looking to re-platform, however, have multiple of these issues. Take mobile commerce, for example. Mobile revenue has jumped dramatically with the combination of social media platforms and powerful mobile devices, over 50% for many retailers. Not having your ecommerce website support mobile visitors cuts out a large selling opportunity, not to mention the SEO hit you take from Google’s newest search algorithms, which reward mobile readiness and penalize sites that don’t support mobile. This means your not only need to have a mobile-friendly site, but that it needs to be fast. Really fast. Not having this one feature (which is really 2: mobile-friendly site and mobile page load speed), which takes months of coding for an on-premise or custom solution, is reason enough to switch — not to mention the financials of having to pay for such coding work. And that’s just a basic example. What about integration with new payment solutions like digital wallets? Do you want to have to build out your individual brand integration with Amazon Pay, Apple Pay, PayPal One Touch, etc? Or would you rather your platform build that out, test it and ensure it works, take on the PCI compliance and ultimately just have you be able to click, one and done it’s live on the product? Below is an outline of each, including pros and cons based on your particular business needs. This is the basic background information you’ll need for issuing a complete and structured ecommerce RFP to a technology provider, the details of which I’ll get into in a moment. This is usually a custom LAMP or .NET-based implementation supplemented by various middleware, the origins of which you may or may not know. Quite often, these platforms are also connected to backend systems running custom-built ERP software. This middleware could easily be replaced by your smartphone today, but nobody dare touch it lest it breaks and brings the whole site down. Pros: The pros of a homegrown platform are that you have the potential for ultimate flexibility. You can customize each feature exactly the way you want, without the constraint of a template. Although in reality, real world resource constraints can mean that potential flexibility isn’t realized. Cons: The cons with a homegrown platform are that you are a customer of one and every feature you want to add has to be developed from the ground up. Homegrown platforms are also often expensive to maintain on a day-to-day basis. With onsite, sometimes called on premise technology, the ecommerce platform is licensed from and then hosted on the client’s internal network. Commonly deployed onsite platforms include Websphere, Oracle Commerce and Magento Enterprise. Cons: The cons of onsite deployments are that you need a small army of IT staff to run, maintain and sometimes update the platform. Also, quite often, companies customize their deployments to the point that they get off of the platform upgrade path and are then stuck on an old version of the ecommerce platform. The cost of these upgrades and maintenance, however, is likely the biggest con. A scaling ecommerce business can spend anywhere from $100,000 to $500,000 per year to ensure an onsite solution is functioning properly. Here’s a calculator you can use to see what your overall costs would be if you were to migrate to or stay on an on premise solution. There’s currently a lot of confusion in market about the difference between cloud ecommerce and SaaS ecommerce. Let’s put that confusion to rest right now. SaaS and Cloud ecommerce are not the same. With Cloud ecommerce, you still pay extra in licensing fees, as well as to patch vulnerabilities and to complete upgrades. This aspect of cloud ecommerce is similar to on-premise. In fact, many on-premise ecommerce technologies are those that are launching cloud solutions. The difference, however, is that the server is hosted and maintained by a third-party, similar to how it is done in the SaaS model. Here are the differences between SaaS and cloud broken out. Server tainted and hosted by a third party. No need to install or keep up with software editions. PCI compliance and security handled for you. No downtime with new software versions. Before we hop into this realm, know that there are multiple versions of SaaS ecommerce platforms. Multi-tenant: customers share the same instance of the application and receive upgrades simultaneously. Multi-tenant architecture is one of the main reasons that SaaS ecommerce platforms have cost advantages over homegrown or onsite implementations. Single tenant SaaS platforms take into account the need for specific brand customizability, but it’s easy to end up off the upgrade path and expose your brand to vulnerabilities (similar to on-premise technology). A hybrid model is the best option for brands, allowing for low total cost of ownership, simultaneous platform upgrades and open APIs for extreme customizability without falling off an upgrade path. In other words, business owners get the lower cost of the multi-tenant deployment with the custom capabilities of a single tenant deployment. 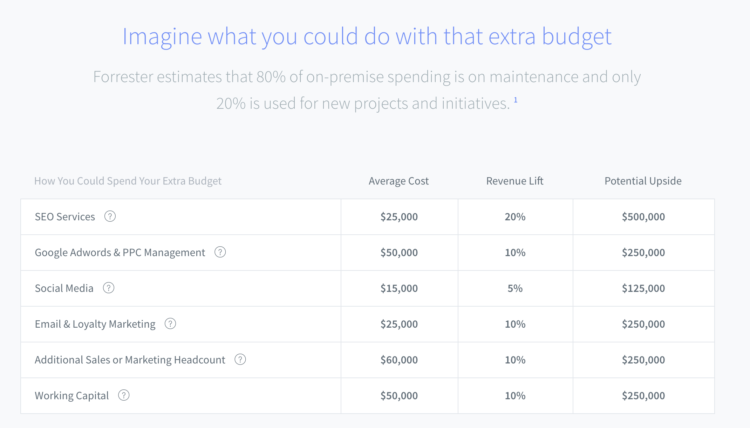 The main aspect all SaaS deployments have in common is their pricing model. Business owners enter into a monthly payment agreement. Some portions of the first year’s fees are usually due up front, but not always. Pros: The pros of implementing a SaaS platform are primarily based on cost and ease of management. With SaaS, the vendor is developing features for multiple customers and so the expense is amortized across the entire customer base, which keeps costs down for everyone. The SaaS vendor’s roadmap is also usually driven by demand from their customers, so you’re pooling requirements across multiple segments of the industry. This leads to a robust product feature roadmap, which meets and often exceeds the requirements of most clients. Cons: The cons of a SaaS deployment are that you are restricted to some degree by the nature of the fact that the platform is usually multi-tenant. This means that the flexibility you might have with a homegrown or on premise platform is not necessarily there. Many SaaS providers, however, have open APIs, which allow for third-party integrators that often function similarly to if you were integrating the software on your owned and operated system. 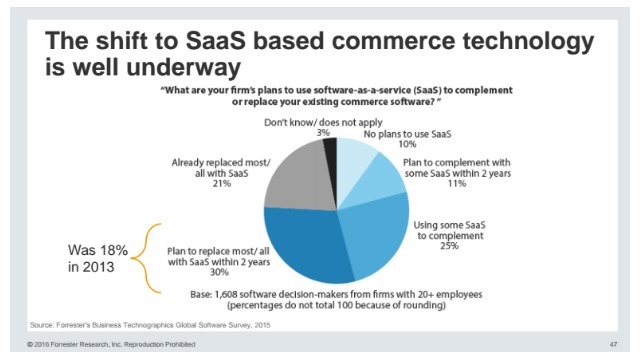 As the SaaS ecommerce industry evolves, this con is much less of concern thanks to open and malleable APIs..
OK, now that you know you need to switch and you know what your options are, it’s time to issue an RFP. Do you know the #1 reason why brands migrate from their ecommerce platform? It’s not just about money – but that is a big consideration. It isn’t just about being able to execute cooler, more impactful marketing campaigns – but of course everything that exists on a RFP is getting at the end goal. No, the #1 reason is empowerment. Ecommerce marketing is harder than ever before. It’s also more costly. Brands can’t afford to move slowly. They can’t afford to NOT be agile. And yet, the vast majority of ecommerce platforms tie your marketing team’s hands behind their back – leaving them bobbing for conversion apples they could on other platforms simply just pick up. OK, that might not be the best metaphor. So, let’s dive in to the real work: issuing an RFP. This will allow you switch from one ecommerce platform to another – all without losing your SEO rankings or customized design or legally required security protocol. 1. Get ready to issue an RFP (request for proposal). A proper Request for Proposal (RFP) process will help dramatically reduce your frustrations or concerns as you determine which SaaS provider is right for your growing business. RFPs are used by scaling and enterprise brands looking to properly evaluate key stakeholder needs, scope and goals in large-scale projects which will affect the operation of an entire organization. The more information you provide in the RFP process, the less room there is for confusion later on. A sloppy RFP could cost you months in wasted time, so be detailed, clear and over communicate your needs. This post will provide everything you need to do so. SHOULD I ISSUE AN RFP? For ecommerce platforms, you should issue an RFP. This because of the various attributes unique to online businesses that must be accounted for. Each ecommerce platform handles these needs a bit differently. You want to see their proposal, along with a quote, not just a quote for typical services. RFPs generally require more work on both parties –– and this guide will explain your part, as the business. Before you start committing the rest of the organization to an ecommerce replatforming project, you should conduct an initial ROI modeling session and begin internally mapping out the RFP process. This is the first step to writing a RFP. Sit down with finance and do an honest review of the ecommerce business. Before you can begin developing a detailed set of requirements and an RFP, you will need to have the numbers for your business locked down. 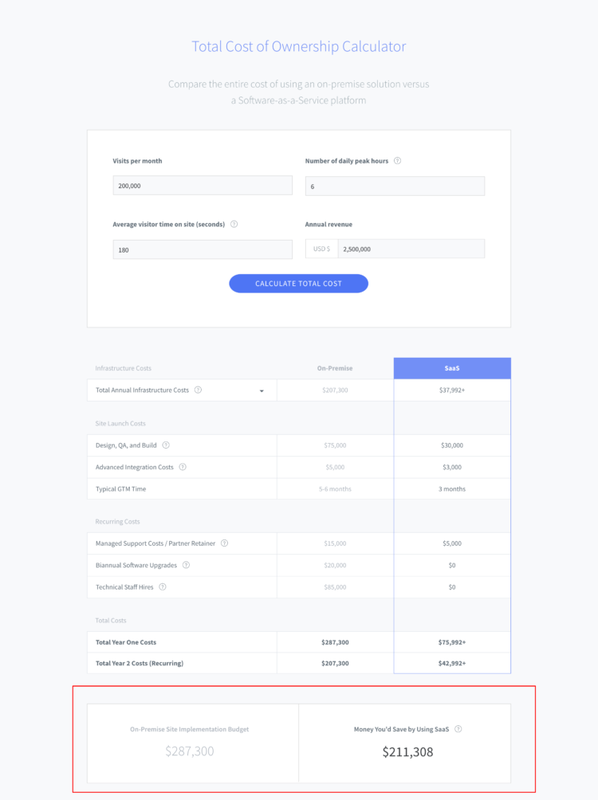 If you decide to go down the SaaS platform route, you will be sharing this information with the vendor so they can calculate anticipated usage and pricing. 3. Forecast revenue and total cost of ownership. 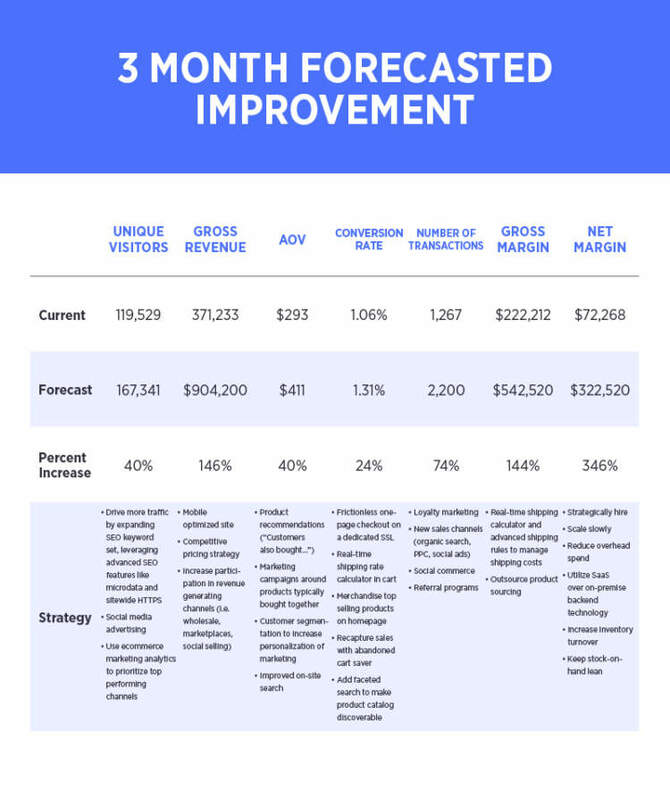 Next, create a three year forecasted improvement on the above metrics if you were to deploy a new platform. Allow six months post launch for site optimization. Don’t forecast any lift during those six months. Here’s a sample walkthrough of how you might achieve this for your own business. The numbers below are based on a last 90 day calculation. The forecast based on 57% overall ecommerce growth by 2018. Conservative numbers are used here. Once you figure out your business forecast, look into how much each ecommerce technology solution will cost. Then, calculate your savings, and figure out the average cost for services like SEO, social media and more. Finally, add in the revenue lift generally seen by these services, and the upside associated with it for your business’ revenue. Again, you can use our calculator to do this automatically for you, or take a look at our sample below. Through this analysis, you will have determined the amount of investment you can reasonably afford for your website replatforming project. This will save you time later on and help you to avoid looking too far into platforms that you simply cannot afford. Many ecommerce platforms will pass you off to a partner for transferring your catalog and customer data (what many people refer to as “data migration”), adding anywhere from $10,000 to $100,000 to your initial launch fee and 6 weeks to 6 months in go-to-market timing. That’s a lot of money and time – and can significantly affect total cost of ownership. Ask the platforms you’re considering about their options and account for this in your ROI model. 4. Investigate built-in functionality vs. third-party apps and integrations. A technical replatforming project is an opportunity to change and improve your efficiencies in other areas of the business. To make sure you get the most, then, out of the RFP process, take a look at all existing business processes and determine if there are better ways to achieve the same results. Many of these can be replaced with features that now come standard on modern ecommerce platforms. Add the savings from these projected changes into your budget. Be sure to calculate that revenue in your model. Here is a calculator you can use to do so. Try to use a fact-based measurement criteria during this discovery process. I prefer projected savings, revenue or ROI. This phase of the process can be contentious since you’re talking about eliminating tools, processes and potentially people. The measurement criteria helps to keep the emotion out of the process. For the fastest and most effective GTM strategy, avoid committees and appoint a project head. 5. Scope integration redirects and initiation. This is the stage of the replatforming process where you should spend significant time and effort mapping out every touch point between the ecommerce platform and all other systems at your company. Create a list of each integration point and determine what will happen to that integration during replatforming. It’s at this crucial stage that you determine what’s in scope for the project and what is not. Proper due diligence at this stage of the process will save time and money later on. Review everything 2 or 3 times to make sure that nothing has been left out. 6. Meet with all potential stakeholders. Confirm that all stakeholders have been given ample opportunity to share their requirements as well as all business processes that interface with the ecommerce platform. Stakeholders are usually from the following departments/disciplines. On a very large project I personally worked on, after numerous sessions with all necessary stakeholders, I asked one last time if we had covered every process, integration point and application that would interface with the new ecommerce platform. Everyone nodded in acknowledgement … until one voice at the back of the room asked if we had accounted for the two guys in Turkey. He explained that those two guys performed a critical database conversion on the global master product data file on a nightly basis. Don’t forget about the two guys in turkey! But don’t go overboard, either. I’ve seen countless million – tens of millions of dollars actually – wasted on high priced consulting firms more concerned about billable hours than finding the absolute best solution for the client. Don’t fall into the trap of over engineering your solution. I’ve also seen architecture scoped out on PowerPoint slides that look amazing but are entirely unrealistic in the real world, either because they would run too slow, cost too much or just not integrate properly. It’s a myth that you can take the “best in breed” products in various categories and try to make them all fit together. It’s much better to get one good platform and use it to the fullest extent possible. I’d be lying if I said I’ve never seen a company scope out a behemoth of integrated apps only to spend tens of millions of dollars and never see it run properly. There are numerous ecommerce platforms available today, everything from simple carts to enterprise grade platforms that include strong search, personalization and CMS capabilities. For our purposes, let’s say that there are about 30 different platforms to choose from. That’s far too many to engage in an RFP. This process is based on our experience and knowledge of ecommerce platforms, and this helps us to narrow the focus of the RFP down to the key features that are most important to the client. That doesn’t include third party integrations, catalog transfer services, systems architecture or security compliance issues — all of which will need to be addressed in the RFP process. Determine the best platform options for your business. Issue an RFP to those platforms. Forecast revenue and total cost of ownership. Investigate built-in functionality vs. third-party apps. Determine integration redirects and initiation. Meet with all potential stakeholders and put platforms to the test. Determine data shopping cart migration service and launch migration. Redesign site, relaunch in beta and QA with stakeholders. Relaunch site publicly, and redirect URLs. Based on the responses to your RFP, you should now have a short list of 3-5 potential vendors. The next step is to create a detailed set of use cases to be performed by the vendor, via webex for smaller opportunities and onsite for larger deployments. Stakeholders get to see what a day in the life of using the platform will be like for them.Their feedback is invaluable. They get to see the different ways various vendors have chosen to execute various tasks in the platform and can see which methodologies might suit their particular requirements better. Lastly, maybe most importantly, they feel a sense of ownership in the process and an appreciation for the final vendor selection. The more important reason for these tests is to make the vendor demonstrate their capabilities live. It’s easy for a vendor to say that they support a feature, but when it comes time to demonstrate it, the finer details are revealed. For example, a vendor may say they support a certain feature but in reality it requires a separate customization to actually deploy it in the field. The list of use cases that you develop will depend on the size of deployment, but for the larger ones, it is advisable to schedule about four hours. Some scenarios take 10 minutes to run through, others can take 30 minutes. It’s very important that each vendor be given the same list and allotted time to complete their scenarios. This creates a level playing field upon which comparisons can be more easily made, especially for the stakeholders who are new to the process. You can use this checklist and agenda for your teams and the platform you are testing. This covers the majority of common needs during a replatform. We also allow half an hour at the beginning of the meeting for a general company sales pitch presentation, and about 20 minutes at the end for closing remarks and a final pitch. Here is what our top level agenda looks like, simplified. Transferring your product, category and customer data is perhaps the most overlooked aspect of an ecommerce replatforming or replatforming applications, in general. Accurate data is essential to running your business. Poor syncing with ERP or POS (think Square or Netsuite). And those are only to name a few. You’d be stuck going through each individual SKU and updating all information for product data that was transferred or migrated incorrectly. For customer data, it would just be lost forever. I cannot stress enough how big of a deal this is. Again, I’m preaching to the choir. So, once you’ve decided which platform, or have narrowed it down to two, you will switch to, ask immediately about migration and transfer services. And don’t let an unclear answer pass. Many ecommerce platforms will pass you off to a partner for catalog transfer services, adding anywhere from $10,000 to $100,000 to your initial launch fee and 6 weeks to 6 months in go-to-market timing. Do not sign a contract until you have this information. If you are passed off to partner, talk to that partner immediately. Get a solid understanding of how the catalog transfer or data migration will be done and similar stores they have already transferred, ideally from the same platform you are on. Reach out to that brand, too, and ask about the service. Better yet, choose an ecommerce platform that provides this service in-house. At MercuryMinds, we have a team of dedicated experts with a combined 12+ years in ecommerce and 10+ years in catalog transfer services. This comes at little to no additional cost to a brand. Because their team has worked with so many brands, they’ve learned that every single online store is unique, and that as they’ve scaled, so has their service. To ensure catalog & customer data is transferred successfully, our catalog transfer services team implements a 3 steps quality assurance process. In the course of performing so many transfers, our team has spoken to a diverse group of business owners, walking them through the process of moving to a new platform. Below are the top five myths they’ve heard about catalog transfers. 1. Data Migration Myth #1: We miss out on sales while you transfer our data. Your store won’t go offline during the transfer process. We do all the work on your new store backend, then give you as much time as you need to customize your settings, test your site and train your team. When you’re ready, and only when you’re ready, you can launch your new ecommerce storefront — complete with updated data already uploaded into your backend. This allows you to continue business as usual from day one. While all of this is happening, your original store stays live on your current platform. We don’t require that it come down, and new platform and our global network of partners actually advise against it. We understand that uptime is one of the most crucial factors to gaining and maintaining consumer trust, so all our work can happen with no downtime required. 2. Data Migration Myth #2: We’ll lose our design if we replatform. Worrying about losing your beautiful, custom design? Don’t. 3. Data Migration Myth #3: When we move the store to a new host, we’ll lose all our traffic. It is true that moving to a new server, even when using the same domain name, can impact search engine rankings if done improperly. The good news, though, is that people move servers all the time, and search engines like Google have best practices which mitigate the effects. We follow those best practices to minimize all controllable risk. We properly implement 301 redirects for your product and category pages. Our goal is to move your product data with the same search ranking foundation you had built on your previous platform. That way, our SEO-friendly platform can quickly drive your traffic to new heights. 4. Data Migration Myth #4: Replatforming means we can clone our store exactly. No, you cannot clone your store exactly. You can, however, transfer a majority of your existing data from your current ecommerce store to your new backend. In fact, we make sure that happens without opening you up to any potential issues or liabilities. As for your store’s look and feel, you’re probably thinking about leaving your current platform because it’s lacking in some way, so why would you want to recreate those same shortfalls? The quicker you embrace the idea that it requires some change to improve your online business, the quicker you can benefit from transferring to a fully featured enterprise solution like BigCommerce. We offer a wealth of next-level features that will ensure your transition is as painless — and profitable — as possible. For instance, with dozens of integrated payment gateways, you’ll rarely need a payment option we don’t offer. Chances are that we have an integration with the payment gateway you are using right now, and you may even find new options like Square and PayPal powered by Braintree that you like more. 5. Data Migration Myth #5: We have great engineers. We can do it ourselves. Even if you’re a great developer, our experience has taught us that the first time you undertake an unfamiliar task like this, it rarely goes according to plan. Anybody who has tried to renovate their own house knows how steep the learning curve can be. Wouldn’t your time be better spent growing your business and serving your customers while delegating your transfer to veteran engineers who can get it done quickly and correctly? Your data isn’t something you want to risk, and we’ve heard our fair share of self-transfer horror stories. When you’re talking about securing and improving your financial future, you can’t afford to let your ego get in the way. Instead, trust your migration to an industry-leading team. And know, this is only documentation. You’ll have an account manager and on-boarding consultant by your side, handling all the heavy lifting, every step of the way. In all, figuring out which ecommerce platform is right for your business is a time consuming task. But a proper replatforming project is well worth the wait. A modern ecommerce backend allows you to streamline processes while increasing site speed, stability and security to outperform industry standards.